Drs. Lan Vo and Sean Breckley are committed to helping patients achieve beautiful smiles they can be proud to share with others. When imperfections detract from the appearance of the smile, it is important to work with a restorative dentist in the Woodstock, GA area to learn about options such as porcelain veneers. Porcelain veneers are a common cosmetic solution to a number of cosmetic problems that can occur with the smile. This includes imperfections such as fractures, staining, and gaps between teeth. Using veneers, patients can cover up these problem areas and achieve a more attractive look. 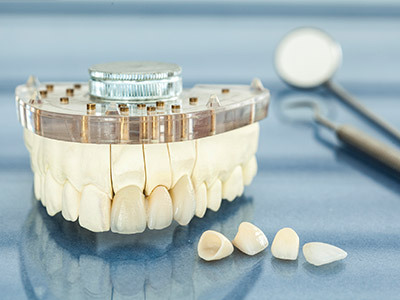 They are facings that are bonded onto the front of teeth to disguise issues that detract from the smile’s appearance. There are many reasons patients choose porcelain veneers to enhance their smiles. The first is longevity. Veneers last several years with proper care, with many patients enjoying them for a decade or longer. Second is their protection from staining. Alternatives such as composite resin bonding does not offer a stain-resistant solution. Third, porcelain veneers are natural-looking. They are almost undetectable in the smile to others, so patients can share their smiles and not feel self-conscious about having dental restorations in their mouth. Woodstock, GA area patients are welcome to speak to the dentists of 32 Dental about the placement of veneers. Drs. Lan Vo and Sean Breckley work closely with patients to determine which cosmetic dentistry options are best for their specific needs. If you live in the community and are ready to work with a dental professional to restore the beauty of your smile, contact the team of 32 Dental today at 770-423-1132. We welcome new patients to our practice.